Despite being soaked to the skin by pouring rain while waiting in security line, the visit to the hill in Washington D.C. was very exciting! We met with staffers in the following congressional offices: Reid Ribble, Gwen Moore, Paul Ryan, Ron Kind, James Sensenbrenner and Tom Petri. We also met with congressman Mark Pocan and his legislative aide. Unfortunately, we were unable to get appointments with our two senators, Ron Johnson and Tammy Baldwin and congressman Sean Duffy. For the first time, it appears that there is some movement with regard to SGR. Every office was very aware of the SGR issue. Every office appeared to agreed that the SGR formula was a problem and should be permanently fixed. Paul Ryan is addressing Medicare issues at the “macro level” and typically has not voted in support of specific SGR bills in the past. Of the offices that we visited, Gwen Moore was the most supportive of our issues. Gwen is already a cosponsor of the bill including psychologists in the physician definition in Medicare and her aid advised her to become a cosponsor of the bill for including psychologists in the incentives for setting up electronic health records. We were told that there are a couple of bills circulating that pertain to making a permanent SGR fix so that we are not plagued with the SGR cuts every year. There is so much information to share with you that I can’t possibly share it in one or two blogs. Over the next few weeks, I will be sharing information with regard to PQRS, psychotherapy codes and the agenda items we presented to our legislators. At this point, I have a request for all of you. 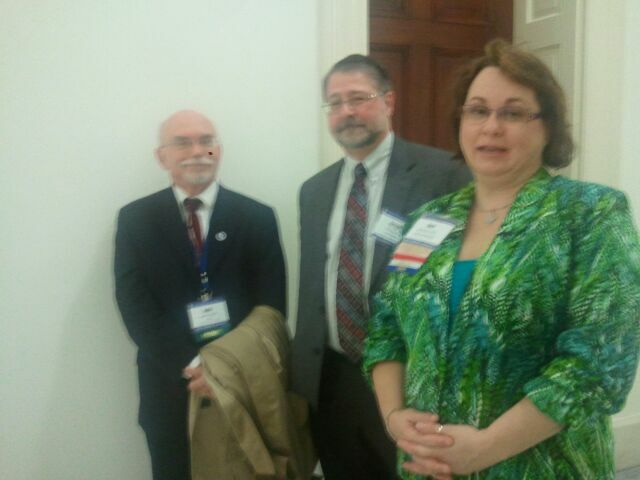 It is important for psychologists to develop relationships with our legislators. I am asking you to help me by being willing to talk with your particular legislators and advocating for the issues of interest to psychologists. Legislators appreciate hearing from their own constituents and all of them accept appointments with constituents in their home office. Gwen Moore’s office made it clear that Gwen likes to visit with agencies in her district. James Sensenbrenner’s office also made it clear that they enjoy visiting and touring in the community because it helps them have a better understanding of the issues pertinent to the community. Please consider setting up an appointment with your representative/senator. I am happy to provide information to you, attend the appointment with you and/or provide any support or assistance you may need. Much more information to come! This entry was posted in The Hill: legislative issues and tagged Advocacy, Advocacy blog, Advocacy Cabinet, APA, D.C. Insurance, Medcare, medicare cuts, on the hill, payment rates, practice central, Psychologists, sequestration, SGR, Washington, wisconsin psycholgical association, Wisconsin Psychological Association, Wisconsin Representatives, WPA on March 14, 2013 by Dori bischmann.